Buying and selling goods online has become more and more popular. More entrepreneurs learn to grow their business by building an online presence. With this manner of marketing, you’ll have a higher reach and will have multiple accessibilities. Merchant and customers can access your eCommerce site using different devices. No wonder why global e-retail sales in 2018 have reached 2.8 trillion U.S. dollars and are projected to grow multiple times in 2021. With this fact, entrepreneurs need to have a fast, secure and easy-to-use website to accommodate buying and selling needs. If you’re one of them, you should see these AJAX WooCommerce Themes we’ve carefully handpicked for you. As you need a website that will cater to your needs when it comes to eCommerce, a group of people builds the complete solution to eCommerce needs. Apparently, WooCommerce provides a complete eCommerce solution that is fast, easy to use, and can adapt to the needs of your eCommerce business. Accordingly, about 2.3 million eCommerce stores are run by WooCommerce. This WordPress plugin is powerful, flexible and carries a lot of features that boost the eCommerce site. The best part is that whatever type of product you want to sell – physical, virtual, downloadable and even affiliate/external products are much possible with WooCommerce plugin. So, check out these amazing AJAX WooCommerce themes and pick the one that suits your taste. In this list, you will be able to create and manage an online store with ease. These themes are built with good functionality, best UI design and are embedded with AJAX so response time is faster which increases the website’s performance and speed. Need a minimalist AJAX WooCommerce theme for your eCommerce website? Why not consider Savoy as your unique and innovative way of marketing? Savoy is one of the minimalist AJAX WooCommerce themes that’s worth every penny you spent. This premium theme is powered by WooCommerce built to give your customers a seamless user experience on mobile and tablet devices. Savoy makes use of AJAX for the shop so updating the cart without reloading the whole page is much possible. The theme is also speed and SEO optimized, retina ready and fully responsive. Savoy comes with amazing features to make your shop fully functional and elegant. It comes with AJAX categories and filters, add-to-cart, and product search. Thus, you don’t need to reload the page so items customers add-to-cart will reflect on the cart. It also features infinite loading for increasing the page views and improve the user experience. Furthermore, this theme uses image “lazy loading”, product quickview, wishlist, mouse-over zoom for product gallery and more! Selling products or services online needs careful planning and the best AJAX WooCommerce themes to make it work. If you haven’t found the best one yet, you can check Woodmart as your effective tool. Woodmart is a responsive WooCommerce theme with AJAX functionality. The theme is built using Bootstrap framework, along with stunning features to improve the shop’s look and feel. It uses AJAX full-screen search & product by SKU. Also, products can be filtered via size and color. Thus, customers can search for products with ease without loading the page. Woodmart has also a built-in mega menu for user-friendly navigation. The 45+ demos layouts with modern and minimalist design can definitely boost online presence and increase sales too. With the AJAX shop, users don’t need to go to other pages to purchase. Purchased items will reflect on the carts and lets you choose from available variants. As the theme is fully responsive and retina ready, the functions, features and the quality of your products’ images on a desktop will remain its quality on mobile and tablet devices. Woodmart supports multi vendors plugins such as Dokan, YITH Multi Vendor, WC Marketplace and WC Vendors that encourages a person, shops or multiple vendors to sell their products with a strategic plan. Clean and minimalist websites never go out of style. They always look fresh and beautiful especially when it comes to websites. Gecko is one of these AJAX WooCommerce themes that is equipped with features that can make your online store stand out! A user-friendly shop always gains recognition. With Gecko you can shorten the process of building your eCommerce website. With the 13 prebuilt demos of Gecko now you can create your website and start making money without coding skills. As all of these demos can be installed with a single click, selling your products and services is just very easy. Whether you want to create a fashion shop, handmade, organic, furniture or any products you want to sell, Gecko has got you covered. The theme is fully compatible with Visual Composer Page Builder plugin so completing your pages is just a matter of drag and drop. Specifically, the theme is equipped with awesome shop features such as infinite scroll, quick view product, meta slider, WooCommerce image variation swatches and more. Gecko is also compatible with YITH WooCommerce wishlist, AJAX product filter and more. Build your online shop with seamless UI design, good functionality and easy to use website using Unero. Unero is one of the ideal minimalist AJAX WooCommerce themes to use for your online shop. The theme is dedicated to selling items so it focuses on your products, making them look impressive and attractive to customers. It is integrated with WooCommerce so selling different products beautifully is possible. To make the theme do a great performance it has plugins and powerful functions embedded into the theme. Unero allows entrepreneurs to sell products, digital items, downloadable products, external or affiliate and many other product types. Unero has a built-in tracking system to easily track shipments of orders. Apart from that, it also offers intricate tax and shipping options. Hence, you really won’t have big problems when you pick Unero as the theme of your online shop. That’s not all, it also contains a built-in coupon system to offer different discounts or special promos to your customers. As the theme has 15 predefined homepages you can skip the burden in crafting your pages. With these prebuilt demos you can easily and quickly build your own site with just one click. If you’re thinking of buying a good theme for your shop, you might want to look at these AJAX WooCommerce themes we’ve collected for you. Here’s Basel, a minimalist AJAX theme built with modern and elegant UI design. It is ideal for any kind of shops like cloth, electronics, furniture, accessories, flowers or any other products. With this theme, you really don’t need to touch codes literally. As it is integrated with WPBakery Page Builder plugin, you can just drag and drop elements to complete the pages of your website. Thus, you get to focus on running and managing your business than squandering much of your time in coding. Basel is built to improve the performance of your website. Thus, it utilizes full AJAX shop, AJAX search, filter forms, wishlist, mega menu, swatches on shop page and more. The theme contains 4 general layouts – wide, boxed, boxed small, and full width. If you wish to have a sidebar layout, you also have 3 options in placing it either on left, right or full width. Basel implements photoswipe gallery for images, built in quick view, and more. Moreover, Basel is compatible with MailChimp Newsletter, Revolution Slider, Full WooCommerce, Contact Form 7, etc. WooCommerce runs many eCommerce stores today. If you haven’t got one for your shop, you can use North as an effective theme for managing your store. 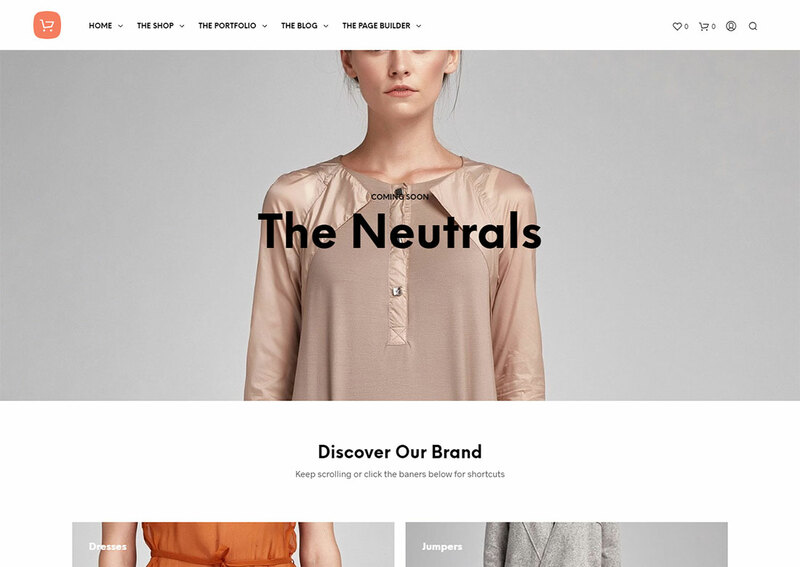 North is a responsive AJAX WooCommerce theme crafted to provide entrepreneurs the easy way to run and manage online stores. It contains 6 ready to use demos for setting up an online store with ease. With North, you have different layout options for posting your products. You can use 6 columns, 5 columns, 4, 3, and more options along with filters and AJAX loading options. If you wish your customers have easy access on the sidebar, North implements the Quick Shop function. Furthermore, North integrates AJAX search so you won’t need to add another plugin for that. The theme also implements the Dynamic Pricing and Discounts plugin so you can always offer dynamic discounts and prices at the product, category and cart levels without the hassle. North has also integrated the WooCommerce PSD invoice, Product Filter, Visual Composer and a lot more. Moreover, it is fully compatible with Table Rate Shipping to help your create complex rules for shipping your products worldwide. Elissi is another powerful, easy-to-use and user-friendly AJAX WooCommerce theme crafted to operate an online store with ease. The 12+ prebuilt demos of Elisse can bring your business to the next level. Whichever you choose from these amazing demos it will surely give you the best elements to complete the pages of your shop. These themes have a clean, minimalist, clutter-free and elegant design for any shop you use it with. Basically, it offers unique product filtering so customers can find the product they’re looking for with ease. It also uses a compare function, wishlist and cart sidebar, product quick view and more. In order to make the theme perform better, it integrates WordPress plugins that are powerful and flexible. These include Dokan, WC Vendors, WC Marketplace, WooCommerce Multivendor and more to create a marketplace where other people can sell their products and get commissions for each sale. Some of the newest features embedded into the theme include emailing function when stocks are available; quick add to cart button and buy now feature. All of these improves the performance of the theme. Minimalist designs are always in and stand out. Supro is a wonderful AJAX WooCommerce theme packed with functions and plugins to create and manage a store. The theme has 18 unique demos that are best for any product you want to sell. Supro is equipped with many essential features to manage a shop. These include mini cart, custom widgets, unlimited color schemes, slider with smooth transition effects, menu with multiple column styles and advanced widgets. With Supro you can sell different types of products even the downloadable ones. Also, if you wish to apply for the external or affiliate programs, that’s not a problem with Supro. Supro also makes use of a sticky header to make browsing your website far easier. It’s one way to provide customers an easy way to navigate with your website along with the mega menu. Since organic traffic is an essential way to achieve success, Supro is built with SEO optimization in mind. Thus, your website will be search engine friendly. The theme also features a product quick view, AJAX add to cart, wishlist and order tracking. ShoppyStore provides you with an innovative, complete and easy to use eCommerce solution to your shop’s needs. It comes with 15 unique demos to build your store with tons of features. With ShoppyStore you can make use of your color scheme that represents your business. Apparently, this theme has 16 preset colors but you can always set it to your own choice. You also have various homepage layouts to choose from, multiple headers and footers. With such elements, you have endless possibilities in crafting your website. ShoppyStore guarantees a responsive and retina ready design. Therefore, customers can access your website using their smartphones and can purchase items with ease. ShoppyStore is one of the ultimate solutions we’ve added in this list of AJAX WooCommerce themes. With AJAX, customers can purchase products with ease as they will reflect on the carts even without loading pages. Moreover, that’s not the only way to monetize with your site, you may also feature products from other websites using the affiliate programs. That’s just made easy with ShoppyStore as it is compatible with Dokan and WC Vendors. It also utilizes the compare and wishlist functions. Maximize the performance of your website with these powerful AJAX WooCommerce themes we’ve gathered for you. Lebe is a multipurpose WooCommerce theme with top-notch features. Aside from the AJAX function, Lebe is packed with plugins, amazing shop features that boost your business. It contains 12 demos which you can import via one-click install feature. Thus, you get to focus on managing your website rather than in construction. With Lebe, your furniture, electronics, toys and other products will look excellent and engaging. It completely supports AJAX shop with intelligent filtering, thus delivers extremely fast speeds and eliminate the need for page loads. Lebe is SEO optimized and speed optimized too. Therefore, your site will get good search engine rankings to improve organic traffic results. It also comes with different types of shops – hover style, shop infinite, minimal, modern and more! Other features of the shop are instant search, AJAX sidebar cart, advanced variant swatches AJAX products, quick view, 360 degree product view, etc. Meanwhile, Lebe implements a function that shows a notification of the latest purchase on the website. Thus, it boosts up sales by letting shoppers know which products are in demand and popular. With the functions, features and capabilities of WooCommerce, it could be the perfect eCommerce platform every retailer needs. Alto is here to help you with your shop goals. It’s an AJAX WooCommerce theme suitable for fashion store, pet store, jewelry, shoes and similar products. It has 15 niche demos that can be installed without hassle. Whichever you choose from these prebuilt sites, an AJAX shop is guaranteed. Hence, it gives the customers convenience in purchasing your products. Basically, you can add AJAX filter, product categories, lazy load and infinite scroll. It also utilizes an off-canvas shopping cart and live search. All of these contribute to the user-friendliness of the theme. With Alto, you can choose to use a boxed or the full-width layout. Other shop amazing features include lazy loading of product thumbnails, touched enabled sliders, product wishlist, comparison and more. Alto is also SEO optimized which means the code is built with SEO best practice in mind: headings, heavy internal linking, google rich snippets and so on, therefore, your site will be visible on search engines. Giving you the opportunity to reap organic traffic with ease. Techstore is one of the stunning AJAX WooCommerce themes perfect for any product you want to sell. The best part of using one of these themes is that you don’t need to know the technical side of things. Techstore is built with HTML5, CSS3, premium plugins and AJAX function. It comes with 3 beautiful homepages with different layout options. Techstore also has various header layout and footer layout. Hence, you have ample options in finishing the pages of your website. With this theme, you can use a boxed layout too or if you prefer the full-width layout it’s very easy to implement. For the color scheme, Techstore offers unlimited color options with Backend Color Picker. So, you can always pick which color suits your business. The theme is SEO optimized, responsive and retina ready. Thus, customers who are using a smartphone can access your website with ease. Furthermore, your site will be visible on search engines, which can boosts your credibility and sales too. In this list of clean and minimalist AJAX WooCommerce themes, we’ve included Antive. It’s a minimal yet modern design of AJAX WooCommerce theme. It has 12+ demos that you can easily install to start your online shop. Antive offers various layouts for your shop, you can use the grid style, list, sidebar, flat, masonry and more. The theme features an AJAX cart, wishlist and compare, mega menu, sticky menu, lazy loading with AJAX. Antive is compatible with Visual Composer for drag and drop page building, Slider Revolution for beautiful sliders, YITH WooCommerce wishlist, YITH quick view and YITH compare for an amazing online shop. Antive also features an order tracking to track orders with ease. See all features included in the theme and see which AJAX WooCommerce themes. Wooxon is a modern, clean and minimalist AJAX WooCommerce theme. It contains 5 prebuilt demos that is suitable for any online store you want to set-up. The theme has features, shortcodes, widgets and plugins that can help you create a unique page layout giving your customers excellent shopping experience. Wooxon uses AJAX function for wishlist, compare, product quick view, and add-to-cart. The theme is highly customizable and is built with the latest web technologies available such as Bootstrap 4, HTML5 and CSS3. Wooxon integrates a newsletter popup for future marketing purposes. With Wooxon, setting your site to the color scheme of your choice is pretty easy. You may also customize product variations, zoom effect, sidebar positions and other awesome customization options the theme can offer. Moreover, Wooxon is compatible with the major browsers so regardless of the browser used by your customers, they can access your products appropriately. With the shortcodes available in Wooxon, you can easily implement on-sale products, featured product, best-selling, top-rated so on and so forth. Want to build an online store without going through a lot in the development process? Why not pick one from these premium AJAX WooCommerce themes and start running your business with ease? Here’s Zella, a WooCommerce AJAX WordPress Theme with clutter-free and minimalist design. Zella comes with 8 stunning demos perfect for any store you want to set up. Having this theme for your business gives you unlimited options for your shop pages – left sidebar, right sidebar, load more, sodebar off-canvas, etc. Sometimes, how you present your product matters a lot in the decision of your customers. Hence, the layout of your products should be well-pleasing and attractive. That’s not a problem when you use Zella. It has various product layout options on how you are going to display your products. With Zella, your customers will have an excellent shopping experience. They can easily filter the products by size and color. You don’t even have to open the product in a new window in order to purchase it. This theme also offers Off-canvas Quick View, Off-canvas cart & wishlist. If you want other vendors to sell on your shop, that’s much possible as the theme is compatible with WC Vendors, Dokan and Marketplace plugins. The post Top 15 Free Shopping Cart e-Commerce Plugins for WordPress appeared first on Colorlib. Do you ever get the feeling that something needs to change? First off, this podcast isn’t broken. I just felt it was time for a change. I have loved interviewing dozens of eCommerce experts over the last 142 shows. It’s been amazing. I just feel the need to twist the podcast up a bit. To move from the conventional interview to a new space. I don’t want to change the focus (that focus being WordPress, eCommerce and monetization). We created our first eCommerce site way back in 2003. It was a stock photography site. After that experience, the next adventure was diving into the membership site phenomenon, which was shortly after my entrance into the WordPress space 12 years ago. Although I touched on eCommerce in several ways over the early years, it wasn’t until the release of WooCommerce in 2011 that I started to seriously dabble in the space. After the inception of this podcast in March 2016, I dove deeper into the eCommerce space in WordPress, interviewing smart eCommerce peeps, writing tons of content around eCommerce, and absorbing all the research my brain could handle. As a result, I’ve learned a few things. Here and Now. An Editorial Podcast. Officially, as of today, this podcast is an eCommerce editorial podcast. Simply stated, I am going to share what I have learned, what I am learning, and how it affects WordPress and eCommerce. It will be filled with facts, reflections, stories, insights and, if you know me, some humor along the way. And of course, what’s an editorial without an opinion? On this blog and podcast, I have written a lot of content and shared expertise from others on how to do stuff. But scattered through the how has been the why. Over the last few years the realization of how important the why is has risen among the experts. Heck, I think there is even a book written about it. Now I’m not trying to toot my horn, but it’s been a part of my teaching for years. In fact, when I first started doing coaching and training in WordPress in 2000, I often had people telling me they appreciated that I not only told them how to do stuff, but why the heck they should consider doing it. That is what this podcast will focus on. They why. Why customers do what they do. Why we as site and store owners do what we do. I am a huge proponent of transcripts. In a perfect world, every podcast would have transcripts. But limited resources can get in the way. What I have learned from having transcripts is this. They are great. They are needed. But something gets lost in the translation. There is an art to writing a post. There is an art to doing a podcast. Sometimes they don’t always blend. My plan is to write a post. Then I will record the podcast. The post is not a verbatim transcript. Nor is it used as a script. It might guide me during the podcast, but I might go on a tangent or two. When the schedule is up and running, the podcast will publish on Fridays. The first one is scheduled for March 22. It’s the perfect way to end your week. But heck, you can listen anytime, right? It’s still audio only, just beca!se that is what I truly feel a podcast is. I’m hoping you will continue to listen in, or perhaps give it a try. Subscribe to it and if I am doing anything to help you, give you something new to ponder, or even a slight chuckle now and then, I’ve done my job. So here we go, a new leg of the podcasting journey for BobWP. he increased usage of smartphones these days expands the growth of online retailers too. Purchasing products and services using mobile devices online is more prevalent than ever. And statistics can reveal that fact. Statista shows that in 2017, global e-retail sales reached 2.3 trillion US dollars and projects to reach up to 4.48 trillion US dollars by 2021. With that fact, it is imperative for online entrepreneurs to make their websites mobile-friendly. If you’re planning to venture on selling products and services online, you must see this list of mobile friendly eCommerce themes. Building a mobile friendly website is not an option but a must! As more people are using mobile devices, you must ensure that your site can be accessed and works well on those devices. Moreover, a mobile friendly website will help you build a good reputation. Of course, people will think that your business is modern, relevant and trustworthy. If in case you need to set up your eCommerce site, you should consider WordPress as powerful content management. In order to help you find the best mobile friendly eCommerce themes, you should check out this collection. As WooCommerce plugin has become one of the most favorite eCommerce solutions, most developers use it in creating eCommerce themes. Who could ever resist such a useful tool that lets you sell anything beautifully? They all have WordPress plugins that can make the store visually appealing, fully functional and elegant as well. Sliders, mega menu, tons of widgets, shortcodes, etc. all these elements work together to build a powerful website! Building your site from scratch may take much of your time. Why would you squander such time when you can easily set up your own site in just one click without touching codes? Sounds amazing right? Here’s Avada, a perfect solution to make a mobile friendly eCommerce website in no time! Avada is a responsive multipurpose theme with numerous pre-built demos for many types of websites. All of these are designed professionally and can be imported with a single click. It offers several layout styles for building an online shop. Avada is fully compatible with the WooCommerce plugin that helps you create and maintain an online shop with ease. It also comes with shortcodes that make the theme more powerful and fully functional. With Avada, you can create a clean and minimalist shop with features that can make it stand out. It makes use of sliders in displaying products. It also has blogs and testimonials that can help boosts your business. You may also monetize with the theme using affiliate widgets. All in all, this mobile friendly eCommerce theme is a must-have for all entrepreneurs. Developing a fully functional shop with your own preferences would cost you much time and money. So why not invest in a WordPress theme that will help you quickly build your website with just a few clicks? Check out this list of mobile friendly eCommerce themes that we’ve handpicked for you. Here’s Sober, a WooCommerce WordPress theme with a bunch of beautiful and minimal prebuilt websites. All of these sites are mobile friendly so you don’t lose great traffic from mobile users. Sober can provide what your online store needs including essential pages such as blogs, portfolio and more. The theme is also retina ready so your content will look sharp, clear and crisp on any devices. It is also SEO optimized and mobile friendly so search engines can find your site and rank it accordingly. If you wish to change color settings for your site, that’s always possible as this theme offers unlimited color options. If you’re looking for the best theme to build a secure and effective online store with a mobile friendly feature, you should consider this collection of mobile friendly eCommerce themes. Here’s Flatsome a responsive multipurpose and WooCommerce theme built with users in mind. This theme can change the way your site performs as it is SEO optimized, mobile optimized, and is optimized for speed. Flatsome features 10 awesome headers for your shop, hence you have ample options in building the finest header ever! Flatsome also features built-in wishlist so your customers or visitors can add items to their carts and purchase later on. Moreover, this theme provides a built-in quick view for checking the details of the product before they finally purchased it. On top of that, Flatsome has large elements library that lets you create any site using built-in elements. These elements include banners, sliders, banner grids, accordion, tabs, price table, countdown and more. Let your potential customers access your website anywhere they are with their mobile devices. With that in mind, you must ensure that you pick a mobile friendly eCommerce theme. Here’s Uncode that is developed to give the best solution to every business’ needs. Uncode is a creative multipurpose theme with cool, unique concepts. It basically contains numerous premade demos that has several shop layouts too. So, whatever type of product you want to showcase Uncode has got a solution for you. The theme is integrated with WPBakery Page Builder so you can just drag and drop elements to finalize your pages. Uncode is fully responsive and is retina ready. Therefore, people from different places can access your website using their mobile devices without compromising quality of content. The built-in mega menu can exhibit your categories with style. For a more intuitive and attract design, Uncode features parallax effects, infinite scroll, smooth scroll, sliders and many other elements. High-quality products need an exceptional website that can assist you in spreading awareness of your brand. If you’re looking for a theme for your shop, you must see Kallyas that we’ve included in this list of mobile friendly eCommerce themes. Kallyas is a multipurpose WordPress theme that is responsive and lightweight. It comes with 65+ demos which can be installed in just one click. Hence, the time you spend in developing your site can be used to easily manage your store with Kallyas. Kallyas contains various types of shops that you can easily take advantage of for your online shop. Whatever products you want to exhibit in your shop, Kallyas has various layouts that one can easily implement. Specifically, the theme has 3 different store landing pages that you can use to drive more visitors to your site. Kallyas has beautiful and user-friendly homepages to show your business’ personality. Start selling your products online and grab opportunities that you’ve never known before. You can do that if you have the best eCommerce theme to create and manage your store. Here’s Shopkeeper, an eCommerce WordPress theme with exceptional design and extensive functionality. What’s best with Shopkeeper is that it has unique features that may seem simple but do a lot to the success of your shop. Shopkeeper supports YouTube video embedded in product galleries and dark/light color customization options. Shopkeeper also provides flexible shop layout. Thus, you get the chance to set your own preferences. The theme also features infinite scroll and load more functions so your customers can spend more time with your site. If you wish to turn off the eCommerce functionality of your site, you can always set it to catalog. Hence, the cart and add to cart buttons can be hidden but can always be turned on once you’re ready for selling. If you’re planning to venture on e-retailing business, never forget to consider the mobile friendly feature of your website. As there are many users of mobile these days, they can be a great source of traffic to your website. Why not check out Porto for a wonderful online shop? Porto is a multipurpose theme suitable for any business and WooCommerce sites. As speed in loading matters to many visitors, Porto is speed optimized for improved performance. With Porto’s powerful theme options you can quickly customize your site without touching codes. Porto has 50+ premade and ready-to-use demos. The theme has several layout variations that you can choose from. For category pages you can use 2-8 product columns. In addition, the vertical mega menu can well display categories of your website. Porto also features wishlist so customers can add items to their cart and purchase them later. It also comes with Ajax search, filtering and sorting functions for a user-friendly website. Get your site done in a few minutes with WordPress themes that are ever ready to help you out. With the bunch of mobile friendly eCommerce themes in the market these days, it is hard for you to land on the best theme. But not when you’ve come to this page. Here’s The Retailer, a premium WooCommerce theme perfect for crafting a beautiful online store in no time! Having a theme that can cater to your needs is indeed valuable. That’s what The Retailer can do, it lets you sell anything on your store – items that are shippable or downloadable. The Retailer doesn’t give you a limit on what products to sell. It allows you to sell ebooks, music, design templates and other downloadable items with ease. What’s more? This theme allows you to start an affiliate business by selling products from external sites and affiliate partners such as amazon.com. For the payment methods, you shouldn’t have to worry as The Retailer also offers payment methods through PayPal, Credit Cards, Checks, or Cash on Delivery. eCommerce websites that are mobile friendly definitely earn more customers and generate more sales. So, find the best mobile friendly eCommerce themes that will give you more opportunity to succeed. Bazar Shop is one of these themes that you must examine. Having a fresh and creative design, Bazar Shop gives you the perfect solution to your eCommerce business. It’s an intuitive theme that can provide you the essential elements you need to build a mobile friendly, user-friendly and search engine friendly website. Bazar Shop offers user-friendly features so customers can easily navigate on your site. It has the catalog function that allows you to turn off the shop mode and shift to catalog mode as you desire. It also has the zoom feature so customers can check the details of the item in your store. Also, you can add a beautiful presentation of your items with multiple images using elegant sliders. Apart from that, best sellers, featured, top rating, on sale, recents – and product categories can be displayed well on sliders too. Set the tone of your online shop without hassle. Check out these mobile friendly eCommerce themes that we’ve gathered to effectively facilitate online selling. With MayaShop you can develop your website without coding skills required. It’s a WordPress theme packed with widgets, shortcodes and plugins that work together to achieve a seamless eCommerce site. MayaShop is highly compatible with WooCommerce so selling products is not a problem. Furthermore, the social icons added to each product can contribute to the awareness of your brand as customers can share products on several social media platforms. With the 10 different styles of homepage layouts of MayaShop your store would have a distinctive look. You can opt for the boxed or stretched out layout depending on your preferences. The theme also offers 8 beautiful sliders that you can utilize for displaying new products, featured items, testimonials, best sellers, product categories and other collections. In order to establish easy navigation of your site, MayaShop utilizes a mega menu, sidebars, tabs, and sliders for showing content with style. With over 2 billion people worldwide buying goods and services online, there’s no reason why you shouldn’t pursue building your eCommerce site. And since most of these buyers are using their smartphones in purchasing, crafting a mobile friendly eCommerce website is a must! With X Store, putting up your store won’t take much of your time. The theme contains 70+ good to go shops with minimal yet elegant, absolutely appealing designs that you can import with one click. X Store has various product page options to showcase your products attractively. As it is fully integrated with WPBakery page builder, the only limit in setting up your site is your creativity. Whatever the product you want to sell, X Store can provide you an excellent eCommerce solution. From fashion store, electronic items, organic products, furniture, drink, etc. X Store has got you covered! It has an intuitive design that lets you run and manage your shop with ease. In addition, if you need to monetize your site through subscription, that’s just a piece of cake with X Store. Getting things done wouldn’t require you to touch codes as this theme’s plugins and shortcodes will do the work for you. It also provides infinite scroll and Ajax pagination to lower your bounce rate and improve the user experience. Planning to build an eCommerce site needs careful analysis. When it comes to choosing the theme for your site, you can pick from these mobile friendly eCommerce themes we’ve handpicked for you. Here’s Neighborhood, a responsive multipurpose WordPress theme that easily lets you build your site in no time! It’s a theme that offers limitless possibilities for your shop with super clean, retina ready, mobile friendly, and slick design. With the page builder of Neighborhood, you can mix and match elements to create unique and incredible pages. Neighborhood is WooCommerce ready, hence your shop will never give you a headache when it comes to management. The theme also features catalog function, wishlist, product zoom functionality and more. What’s more? Neighborhood does not only guarantee the security, aesthetics and functionality of your site, it is also SEO optimized. Thus, your site is search engine friendly that will help you boost your organic traffic. So, what are you waiting for? Check out the demo so you can see if this theme fits your shop. Electro, as the name implies, lets you create an outstanding electronic shop that is fully functional. However, you may always customize the theme to fit your needs. It has 7 different homepages that you can use for your products. Whichever you pick from these awesome layouts, your site will always be visually appealing. Electro is compatible with YITH WooCommerce wishlist and YITH compare functions, all these contribute to the good functionality of your shop. Since color also plays a great role in the overall look of your site and for marketing techniques, Electro lets you choose from the 9 common colors as your color scheme. You may also rearrange sections and add new elements for your site. Of course, your site should be mobile friendly, that’s why Electro makes sure you have a good looking website on mobile devices. Hence, in just a few clicks, you will have a seamless shop without coding. Time is indeed precious! If you’re an entrepreneur who wants to venture on online shops, you don’t need to do the coding yourself, you can choose from our handpicked collection of mobile friendly eCommerce themes. Atelier is one excellent theme you need to consider. It’s a creative multipurpose eCommerce theme which contains 14 high-quality demos that are ready to use. This feature-rich theme has a clean, minimal and modern design of shops. Built to improve your business regardless of what device the customer use, Atelier is guaranteed to be mobile friendly and responsive. Atelier is created with awesome animations for several elements such as animated headers, cart animations, add-to-cart-process, and more. The impressive mega menu can display well the categories of your shop. Thus, gives you customers ease in navigating through your site. It also fully supports Yoast SEO which will help you market your site, grow your business and meet the business’ objectives. There are more useful features you need to see with Atelier so check out the theme today! Build and manage your eCommerce site even without the skills in coding. With Jevelin, you can achieve such goal and may even surpass customer’s expectation. Jevelin is a multipurpose responsive WordPress theme that uses WooCommerce as the powerful plugin to make your store function well. Jevelin has 27 prebuilt demos that can be exported with just a click. It’s highly customizable, from settings, options, layout and other elements you can easily set your pages to your own preferences. The mega menu does not just improve user experience but improves content layout and design. Jevelin utilizes the Unyson drag and drop page builder to easily complete your pages. You also get the chance to use social media for promoting your products as this theme integrates social share functionality. But that’s not just the great source of product promotion as Jevelin is SEO optimized, you can acquire organic traffic source which is a great indication that your site is gaining popularity. Jevelin also makes use of a smooth scroll, parallax effect for footer and more. Want to create a minimalist shop that focuses on your store’s products? Why not consider Savoy as a theme for your site? Savoy is a minimalist Ajax WooCommerce theme built with speed and SEO optimization in mind. It comes with several layout designs for your homepage so you can opt for the best one that fits your taste. Savoy features most of the useful functions, shortcodes and widgets to make the site perform well. It also integrates a mega menu that keeps your content organized while it delivers your message in a striking manner. If you wish to integrate a video for your customers, you can easily do it as Savoy allows you to embed a video easily. Building your website from scratch will cost you time and money. But building websites in this modern age is not as hard as before. With just a single click, your website can be set up without the hassle that will save you ample time and money. Here’s Blaszok that we’ve added in our list of mobile friendly eCommerce themes. Blaszok is a powerful eCommerce theme that has 25 awesome demos. The theme is responsive and is retina ready, hence your site will always look presentable and pixel-perfect in diverse devices. If selling online is your passion, Blaszok is one of the themes you should look at upon setting your site. It’s integrated with WooCommerce so selling anything is just very easy and effective. Improve your website’s look and feel as you pick WoodMart as the perfect solution to your eCommerce website’s needs. Woodmart is a responsive WooCommerce theme with a clean and user-friendly design. It comes with 45+ demo layouts that you can easily import and start the customization. WoodMart has numerous functions that can you implement well into your site. It is built using Bootstrap 4 framework, HTML5, CSS3 along with WordPress plugins. The theme is also powered with Ajax technology where users can easily filter by size and color of products. WoodMart also lets you use the Visual Composer to create your mega menu content. WoodMart will also help your site become search engine friendly with its Yoast plugin compatibility. Online shopping is popular in this modern day. You can find different stores that stand out with their quality products and of course a good, robust website. Hence, it is very important that you build your online store with good functionality, robustness, and speed optimized. If you need mobile friendly eCommerce themes you can pick from this list. Here’s Basel, a responsive eCommerce theme that is packed with amazing features to run and manage any type of website. Basel can make your website mobile friendly and user friendly too. With this theme, you can easily turn your website into a full eCommerce store. As it is fully integrated with WooCommerce plugin, setting up your online shop is very easy. Furthermore, Basel theme has mega menus that can display lots of content. Also, these mega menus can easily organize complex navigation layout. Since a forum is a useful tool to keep visitors coming back to your site, Basel is compatible with bbPress plugin in order to create forums on your websitewith ease. What happens when you have been developing stores for customers and clients and decide to become a store owner yourself? In episode 141, we dive into this topic with someone who has done just that. Micheal Tieso worked at WooCommerce and Automattic on the developer side. While he was still working with clients, he made the decision to start his own online store. Store owners and developers alike will learn a lot in todays’s episode. What were his reasons for wanting to start an online store? Does he have more empathy for store owners since he made this move? What was his previous experience in eCommerce and has his perspective changed? What has he learned and what does he think store owners need to be on top of? What are would be the benefits to developers running their own online stores? Bob: Hey, everyone, welcome to Episode 141. We have Michael Tieso with us today. Now, Michael is a developer. I like to just call him an all-around e-commerce kind of guy. How are you doing Michael? Michael: Good, good. Thank you for having me here again. Bob: Yeah, I believe this might be your third time on this show. I’m not sure. Michael: Yeah! Yeah. It’s always fun. Bob: So we’re getting up there. I keep telling somebody else that when it happens the fifth time it’s going to have to be like Saturday Night Live used to do: the five-timer club. It’ll have to be the five-timer something. I’m not sure what that is but … anyway, for people who don’t know your background, let’s talk about your recent transition from developer to store owner. To set the stage, tell us a little bit about what you’d been doing prior to this in the eCommerce space? Michael: Yeah. So for four years I was working with WooCommerce. It was a combination of Woo things at the time, and then they and Automattic combined. For four years I worked in support and development— and business development. And then almost exactly a year ago today, I decided to go freelance doing just development work, and so this past year I’ve been just working mostly with clients in building their stores and consulting. So it’s been mostly building sites for other people and supporting them, for roughly five years. Bob: Now, somewhere along the line comes this decision that you’ve been building all these sites so why the heck shouldn’t I just run an online store? Tell us the story behind this and what you’ve done lately. Michael: Yeah. So it’s actually been on my mind for a long time to run my own store. I just never got around to it. But what’s different this time is that I’m doing a physical product, shipping a physical product. It’s easy to create a digital product. Well, easy in a sense that there’s not as many puzzle pieces or logistical issues that you have to think about with digital product versus physical. So this was the first time I decided to try something physical. It’s been in the back of my mind for a long time and I just decided now is the right time. In fact, I just remembered that the first time I was on your podcast and you asked me if I were to start a store what I would do. So this is how long I’ve been thinking about this. I said tea. And I was pretty broad about it then, but I knew this whole time that I wanted to start this, what is called the yerba mate. It’s something related, it’s like tea. And so I’ve always wanted to do this. I just never did it. I knew it wasn’t going to be easy and I had too many other things going on. I was working full-time, so it needed to be something that I would just do on the side. But I never took that leap. So now I finally did it. Bob: Is this product that you’re talking about, is this something you have a personal love for already, and that’s part of the reason you decided to do the online store? Michael: Yeah. Yerba mate is a tea-like drink, primarily from South America. And my family, I was born and raised in the States, but they are very Argentinian. So I went to Argentina every year, and we would always have this drink out there. I was raised with it. So this tea-like drink was just around all the time. And I didn’t really think much of it. But then later I would realize that, “Hey, this is not like a typical American thing that people would have around their house.” And I started to grow a passion for the drink and started to realize it’s about something that my family was into because we were Argentinian. And it just kind of grew, and I still drink it often. I still drink coffee and other teas too. But I just had a passion for this drink. And I found it actually difficult to find really good quality organic yerba mate. But it’s so big in South America. Why hasn’t it picked up quite as much in the States, I thought. So I thought I would try this out and see where this leads me. I might not become a millionaire off this, but that’s quite all right. It’s just something I’m passionate about, that I think has some potential. Bob: You have me intrigued. I’m going to have to order some now. Yeah, it definitely sounds interesting. I’m just going to have to, just knowing you I’ll just have to at least give it a try. Once you’ve started this, and I know you probably have a lot of stories to tell through this whole process: like, okay, I was a developer, I was building sites. And now I’m a store owner. Do you find yourself empathizing with store owners more these days? I mean, before it was like, “Okay, I knew this.” But now it’s like, “Oh man. I feel your pain”? Michael: I think it’s hard to realize how many pieces to this puzzle there really are. As an example, I remember supporting WooCommerce customers or some clients who were just saying, “Oh, just turn on free shipping for everybody. What’s the big deal? Why do you have to deal with all the shipping stuff. Everybody likes free shipping.” But it’s so much more complicated than that. You can’t just say, “Free shipping all the time.” It’s going to depend on what you’re selling and how much. And if you offer free shipping then that might cut your bottom line. And it’s just, there’s so much more to it than that. And then trying to figure out the cost of all of it. As an example, there are all the extensions, right? It’s 100 dollars here, 200 dollars there. Keep adding more and more extensions and it becomes something that might cost you a couple thousand a year, just for the extensions that you need to run your site. So things can get costly and just unexpected things come up more often than realize. I think I have a better understanding now that things may not be as simple as they appear. And although e-commerce is obviously inexpensive to start, things can add up fast if you’re not careful. I’m fortunate that I have experience in knowing what all the extensions do, so I don’t need to go overboard. And I can also just make my own functionality if I don’t want to use an extension. But a lot of my clients don’t have that ability. That’s why they hire me to do that for them. And so costs can go up quite high because of that. Bob: When you said about the cost of extensions, I thought, “My God, Michael is sounding like a store owner now, for sure.” Because that is a constant struggle. Michael: Yeah, it’s tricky because if you were to develop those same functions… Say WooCommerce subscriptions. It’s very inexpensive for what it does. It’s amazing. Deployment is fantastic. But it only costs 200 dollars a year for updates and support. When I say only that’s a good deal for what it is and it would be much more expensive to develop that on your own. But when you start to add up everything, subscriptions by itself is very inexpensive but then you’ve got like another 10 extensions that you’re going to add, it really starts to add up. So it made me think about what features I really need now. What can wait and what can I make myself? So I started holding back some of the things. Which actually helped because then it makes you just simplify the business a little bit before trying to go overboard with it all. Bob: I’m hoping I’m not redundant here, but kind of segueing from that into being the developer again, and now being a store owner. Is there something that your perspective has done a complete 180 on? You’ve already talked a bit about like the free shipping. Anything else you were adamant about and now that you’re in that store owner’s shoes you’re thinking, “Boy, I’ve totally gone 180 on this”? Michael: I guess the free shipping is one example there. Sticking with the shipping, there’s this whole process behind the scenes that store owners go through that doesn’t necessarily touch WooCommerce, but needs to connect with it in some way. I have a fulfillment company that ships out of New York, and to just organize our whole process of how to get all my packages from South America to the warehouse, make sure that all of that is sent in the perfect way to the warehouse, because otherwise the warehouse will charge me extra money because it’s got like, I don’t know, the wrong dimensions or something. And then making sure that that inventory and that fulfillment is sent with my WooCommerce store. So it was the tedious task of putting in all those shipping rates in because there’s no like way to import all of that stuff. And then I had to do it for like standard shipping, expedited, and then for each individual country. So there’s a lot of work that goes into this stuff. It just seems, there’s no easy way to do it, but a lot of redundant tasks and a very tedious task. It’s not quite as easy as what it seems. And I thought maybe there would be a way to just like import all these shipping rates. But there wasn’t a way. Maybe that’s something that should be known or something. I don’t know if other developers or store owners know that—buy into it. So that’s another example. Other things? Another one is taxes. Bob: I was going to ask you about that. I was curious. Michael: I’m still pretty lost how that works. I really like integrations with, like, Avalara and TaxJar, where they’ve automated the whole thing. So I try not to even think about it. I think it’s worth it to just pay someone else to just figure it out for me. And of course, that costs; it’s a little bit more of my bottom line. Everyone is trying to take some of the profit I make on my product. But it’s worth it to me for the peace of mind. So that’s taxes and shipping. Then there’s the payment gateway. And figuring out the ROI. (If this product costs me 10 dollars and customers are buying it for 20, how much of all these things are cutting into the product. It can be hard to calculate. For example, if the warehouse is costing me 100 dollars a month for 100 products, how do I figure the ROI? Just so many things I didn’t realize before, when I was creating sites for clients. That there’s more to it than putting up WooCommerce site and then turning it over to the client. Before it was like, “Just sell it. Put the products as 10 dollars and you’re good.” There’s quite a bit more. Michael: Yeah. And that’s probably why a lot of store owners hire developers. And for some companies they can do it themselves. It’s really not that hard to build a WooCommerce site, right? We’ve made it pretty easy. There are a lot of wizards now for WooCommerce setup and WooCommerce itself has a wizard. And there are a lot of integrations. And page builders. It’s not very difficult. I think the harder part is figuring out all of the logistics of products and serving customers. These are things that may not come to mind right away, but as you start to publish your product on Google Shopping or Facebook Shop, and you try to put it the policies on there, your ads may be declined because they require all these things to be perfectly like on the site. You’ll notice on the yerba mate site I launched, on the very bottom, there’s a phone number. I forgot what I had to do that for; I think it was for Google Shopping. They required a phone number to be displayed clearly on the website. I never would have thought about that. In fact, I tried to avoid having a phone number on there at all. It didn’t seem like people would actually use it. But that is a requirement, I’m guessing for legitimacy, just making sure that this is a real business. Now I have a contact number there, which doesn’t go to my phone luckily. It just goes into this ticketing system. But that’s just one of the many things that you start to realize. Bob: All those little details. Now, have you, and not even sure if you’re at that point and I hadn’t really planned on diving into this part it because it’s another whole realm of it. But have you started touching on the marketing part of things? You were an independent developer for the last year, so you got to market yourself as a developer. Now you’re stepping into the store owner role. Now you have to market your store. Any specific challenges you found there? Because obviously marketing services and marketing products, I mean there might be some crossover but are some differences, too. Michael: That’s the fun thing about being a store owner. You wear many hats. If you’re not a developer, you almost have to become one. Even if you hire somebody, you still need to learn a little about the development side of things. Same with marketing. I have some experience with marketing just through my time at Automattic and looking at what the marketing team was doing and being close with them. I’m actually looking forward to the marketing side. I haven’t delved too much into it. I just started planning that aspect of it. I’ll be probably heavy on the Facebook ads initially. And I’m going to try out Instagram and perhaps a few others. Google Shopping for sure. I’ll be starting off with ads and see where that leads me. I still need to do a lot of research and play with the numbers. But you have to put a bit of money down for this to all work. You can’t start a store without putting something in there. Bob: We’ll have to have you back several months down the road because I’d love to hear about that next journey. Because I’ve talked to a lot of the marketing experts who try to help other people market their online stores, but I think it would be really interesting to hear your experiences over the next few months with Facebook, the Google Shopping. Because, I mean, you can hear it from somebody that basically does it for a living. But actually hearing it from a store owner who has gone through it and found the things that work and things that haven’t worked is a lot different. Maybe we need to have a part two of Michael Tieso. Michael: That’d be great. I’m looking forward to it because I think there’s something about the all-data aspects of the marketing side of things and trying to analyze what works and what doesn’t and testing it. It seems like a fun thing to experiment with. I started this website because I felt like I needed to learn something, beyond what I was doing for clients. I wanted to, as they say, eat your own dog food. To dive into something outside of my day-to-day stuff, to give me a better understanding of my work for clients. I’m still primarily a developer, but also now a store owner. Perhaps that will change and this will probably become really popular and that would be awesome. Now, because the amount of investment that this requires have to do a lot of the development stuff as well. In fact, I told my wife earlier today, “I hope my shipment has arrived at the warehouse and all.” She was like, “So how much did you spend there?” And then I told her. Agh! It’s an investment. You’ve got to put something in. But you have to be careful, too. I’ve heard horror stories where people are putting thousands of dollars into something they don’t know how to market. So they have hundreds or thousands of this product that they don’t know how to sell. So I’m trying to be very cautious of that as well. I’m being pretty careful about it. Because it can easily fail. I hope it doesn’t. I don’t think it will. But I if it does, it’s not like I put my life’s savings into it. It’s been a wonderful learning experience for me. And has already paid itself off. Bob: Right. You’ve created your store. You talked for years with store owners when you were at WooCommerce. Is there something we haven’t touched on that you have learned by creating this store, something that you saw over and over again and, talking to other store owners, they never really got a grasp of it? Something, besides what we’ve talked about, that they should really be on top of? So I have better understand the difficulty of having a process in place that works well to update your plugins, of testing everything, of making sure everything works well. And maybe you can’t catch everything. But you need to make as sure of that as making sure that the main components of the website work well. Test the checking out, adding something to your cart, payment processing, stuff like that. I think it’s a little more difficult trying to test every scenario. So I have a bit more empathy for those who are having a hard time continuous updates of plugins. It feels impossible to catch up with the amount of updates that all these plugins require. Bob: All right. In a perfect world every developer who builds e-commerce sites would also be a store owner? Michael: Oh, for sure. More developers should start up a hobby site, you know, something on the side. Just sell anything. Set up a store and, a live store, not just one that you’re developing locally. Developers would learn a lot from just creating a site and putting it up there. Even if it’s on something that just generates a product for you. Like Printful. Or drop shipping with AliExpress. Something that puts you through the process: from nothing to something. A site where somebody goes to your site and buys something. And receives something. Digital is better than nothing. But physical will take it a step higher. Because there’s so much more to a physical product than there is for a digital. But it depends on what you’re selling digitally (if it’s like a membership or something like that). It would be great if more developers created something on the side, launched a site and sell a product. Bob: Now you (and everyone else) know why all those years I had WooCommerce on my site and I sold everything but physical products. Michael: It really is difficult. That’s also why I didn’t do it for many years. I’m so nervous about this process, because right now I only have one product. And I hope it works well, but … it makes me nervous about it failing. It’s not quite the same as a digital product, or committing to hundreds products. But I hope it works out in the end. And this is something that I think many store owners are going through as well. Many a startup with products they need to sell. Bob: Well, how can we support Michael and where is this site? Why don’t you tell us the URL of the site and where you are on Twitter, in case people want to follow your continuing saga of this. Michael: Yeah. The site is called Matero. It’s spelled M-A-T-E-R-O dot C-C. That’s a Spanish word that means somebody who likes to drink mate. And cc was available so it seemed like a good domain. That’s my actual store but you can follow me on Twitter where I’m tweeting quite a bit about this whole experience, and it’s my full name, Michael Tieso. I plan on doing some articles. I think it would be fun to also write more in-depth articles about my whole experience with this, on my own personal website, which is artofadventuring.com. Michael: Those are the three places where you’ll find everything. Bob: All right. Well, I’d like to thank everybody for tuning in. Find our podcast on all the popular podcasting platforms or over on bobwp.com. I enjoyed hearing this journey of yours, Michael. Thank you again for taking the time to join us on today’s show. Check out our collection of the best eCommerce Adobe Muse templates for crafting the most stunning and lucrative online stores. What’s best, there is no coding nor design knowledge required. Everyone can build a webshop as of today. Adobe Muse is a powerful website making tool with tons of different customization options rivaling both WordPress as well as Unbounce in today’s fight and struggles for big and powerful editors. Of course, Muse comes with its count of unique features and various issues as it is, you know, relatively new and all. It is not going to be a detriment to you to try it out, though, like I said it could be just as good as the leading website editing products on the market today. Moreover, if you are still slightly skeptical, well you can try it for free and see for yourself! Adobe Muse does not export fully responsive templates as of yet, but as we are waiting for that features we can try out all this awesome stuff we have right now! With Muse, your website will automatically adjust to all modern devices without you needing to spend a second more on trying to figure out how to make elements fit in different screen sizes. It is all there, you just have to play around with it to get the result you want. Everything you need to set up an entirely excellent service website or shop, blog or whatever it is you need. It is all there, from the SEO options to all the different free elements you can download online and use to boost your online presence. Couple all that up with our fantastic selection of eCommerce templates and you will build the shop of your dreams. Never worry about another product getting lost in your confusing CRM pool and create your website the way it was meant to look. Slick, intuitive and fast. Set up your payment system, link your credit card, add products that you will be selling. Afterwards, customize your home page so that it contains marketing information for your customers to read what your store is all about. Maybe have a section for featured products where you can show off your best goods. Use all that, along with these premium Adobe Muse templates to create and build your online eCommerce presence which your customers will find a joy to visit every time. Make them say “I am glad I found this website and ordered this thing, I will probably want to do it again once a sale comes up.” Moreover, that is what you will be able to achieve with this excellent selection of eCommerce Adobe Muse templates we have for you today. Try some of the demo’s and see for yourself! Display sophistication and competence with a responsive template that suits your meticulous taste. Neptuno is undeniably the one, and very likely, last, eCommerce Adobe Muse template you will ever need. Explore multiple features that you can take to your full advantage when building the right online store for your business. Customize everything without the sweat and introduce your signature style to differentiate yourself from the masses. Utilize Neptuno’s cutting-edge technology that saves you a ton of time and effort. This way, you could create a website like a pro. If you are looking to bring into being an eCommerce platform with a refreshing look, you better get your hands on Neptuno. This tool will take things to a whole new degree for you thanks to its uniqueness and creativity. Start today and begin making epic moves to reach the business success you always wanted to achieve. Scrofa – very responsive and multipurpose eCommerce Adobe Muse template, which has a remarkable and modern design. This theme is highly customizable, so you get several options regarding editing the functionality. Try it today and get a clean look along with drag & drop functionality for your site! Your best pick in our collection of eCommerce Adobe Muse Templates? That brings us to the end of our list of the best eCommerce Adobe Muse templates. There are several ways of creating software, but if you have decided to go with Adobe Muse, then you have come to the right place. We hope that our round-up of Adobe Muse Templates will work great for your eCommerce purposes and will come handy to you. Hence, if you need more such awesome themes, check out the other Adobe Muse templates roundups on our site.